A leader in DC-based LED driver IC technology, Texas Instruments has now launched an IC that enables simple AC-driver SSL product designs. So-called AC-LED technology has been the primary province of companies such as Seoul Semiconductor and Lynk Labs that sell light engines that combine LEDs and the AC-drive technology, but going forward solid-state lighting (SSL) product developers will have direct access to the technology in IC form. 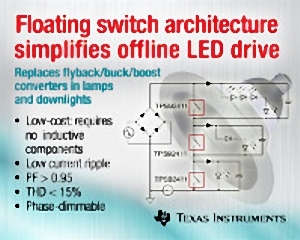 Texas Instruments (TI) has extended its presence in the LED driver arena, launching the TPS92411 MOSFET switch intended to simplify the design of AC-based LED light engines. The allure of an AC driver is that it is much simpler than the AC-DC switching power supply used in conventional LED drivers. John Perry, product marketing engineer at TI, said that the bill of materials for a driver using the new IC will be 20–50% cheaper than SSL drivers using DC-based drivers. Moreover, the AC approach will result in a simpler circuit board. And there are no inductive components required for filtering. We have predicted that AC-LED technology would evolve to be just another driver option at the IC level. Indeed, Seoul recently announced that it would sell its Acrich IC separate from SSL light engines, although customers must also buy LEDs from the company to buy the IC. DMB Technology recently announced an AC driver IC. Also, there are also a number of startups working on AC driver ICs. The TI approach is like several in the industry that segment LEDs in stacks so that more LEDs are powered on as the AC voltage rises in each half cycle of the AC line input. The line is first full-wave rectified, meaning that the LEDs are switched at 120 Hz. The difference in the TI approach is subtle but significant. Other implementations presented at conferences place the LEDs in a large series stack with multiple taps located strategically along the stack. As the AC line input rises, the supply voltage comes from a tap higher in the stack and therefore illuminates more LEDs. TI, however, uses active switches and electrically isolates each segment of LEDs in the stack. The TPS92411 is essentially just a switch that floats relative to ground. As the schematic in the nearby image indicates, multiple switches are used in a design with a relatively simple set of discrete components required. The advantage of the switched approach is that you can place a small capacitor across each LED segment to store energy. So even when the AC line voltage is too low to power the entire LED stack, the capacitors take over and keep all LEDs lit, thereby increasing LED utilization relative to other AC-driver implementations. TIs Perry said that the design eliminates flicker issues associated with some AC drivers. It also presents a near-pure resistive load to the line and therefore has an inherently high power factor above 0.95. Moreover, total harmonic distortion is less than 15%. TI also has released a development board that will allow SSL product developers to immediately experiment with the technology.